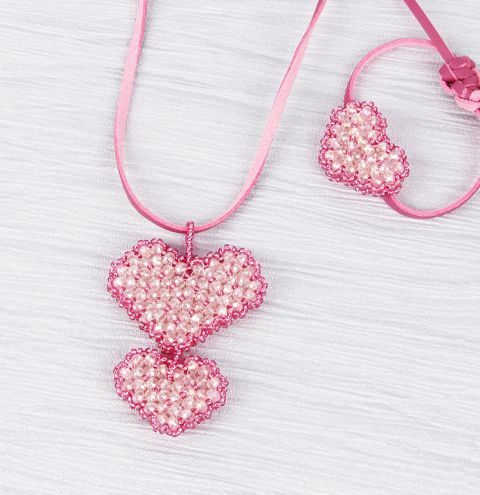 Make these sparkly beaded hearts and wear as a pendant or bracelet charm! Large Pendant Heart Step 1. Cut an arm span of thread and attach a needle to both ends, you will be making these hearts with a right-angle weave. Thread on 4 rondelles and place them in the middle of the thread, then form the beads into a diamond shape by passing the thread through the first bead you strung, pull the thread tight. 2. Add two beads onto one needle and add one to the other needle. Using the needle with one bead pass this needle through the last bead on the other thread and pull tight. You are now creating a right-angle weave. Continue to add a further four rows in the same way, on the last row ensure your thread exits at the side rather than the bottom. 3. From your last row, you have exited on the side continue to add a further five rows. Again, as you exit the final fifth row ensure you exit on the side. You have now created the bottom V-shape to your heart. Now right angle weave down the inner side of the five rows you have just added. You will see that as you add a row you will be using beads that have already been strung. 4. Continue to complete this row through the V-shape and up the other side and exit again on the side of your last row. Weave down, through the V-shape and up to other side for the last time, finishing the shape of the heart. Using the remaining thread, weave all the way around the edge of the heart adding size 11 seed bead between each rondelle. Then work your needle through the rondelles in the heart and add size 11 seed beads in the same manor. 5. Create another heart exactly as you have above. When finished, you will be joining both hearts together giving the heart pendant extra stability. You should still have enough thread left to join the hearts together by using the size 11 seed beads. Hold the hearts together and thread through an edge seed bead on one heart, add another size 11 to your needle then thread through the opposite seed bead on the other heart. Pull tight and thread back through the added bead and back through the seed bead you started with. Continue to do this all the way around the hearts. 6. Once the hearts are joined you can now frill the edges. Start on one heart and exit on an edge seed bead, add three seed beads and take your needle over the rondelle and into the next seed bead, creating the frill. Continue to do this all the way around both hearts. 7. Final stage, you should still have enough thread to create the hanging loop from the top of the heart. Weave to the centre of the top V-shape and exit the centre seed bead, add 20 seed beads and thread through the other hearts centre V-shape seed bead. To ensure this is secure weave through all the beads loop through the beads again. Knot off your thread and weave the remaining thread throughout the heart pendant. On your last complete knot, tie a normal knot and pull it tight to secure it and cut off the remaining ends. Then on the necklace ends tie a knot on each side as close as you can to the end of the cord. Follow steps 1 – 8 to create the smaller heart, however use 4 rows rather than 6. Join the hearts together by forming the loop in step 8, but add 10 seed beads, pass the thread through the bottom of the large pendant seed bead, add another 10 seed beads and back through the top V-shape of the small heart. Then weave back through the loop, tie off your thread and weave the remaining thread throughout the heart. Follow steps 1 – 8 as you did to make the smaller heart. When you have joined and frilled the edges, decide which side of the heart will be the back of the bracelet and weave to the left side of the top of the heart, exit an edge seed bead and add 5 seed beads then miss the next seed bead and through the following edge seed bead, creating a small loop. You need to create a loop on the right side of the heart, so weave through to the right side and create another loop. Cut a length of 28cms and another of 20cms of the leather/suede cord then thread on the bracelet heart to the centre of the 28cms cord and follow the Macramé knotting instructions above for the clasp.